The first gameplay trailer for rain has been released, since the game was first announced at Gamescom last year. 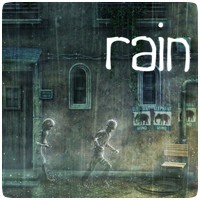 The story of rain is the enchanting tale of a boy who chases after a girl with an invisible silhouette. After discovering that the girl is being hunted by ghostly creatures, he embarks on his own journey into the mysterious world of rain to save her and discovers he has also become invisible.